Ed Thompson, Director of Athletics for the FHSAA, presented the 2019 track and field rule changes and season information at the Florida Athletic Coaches Association this past weekend. At the FACA track and field clinic, coaches gathered to discuss issues for the FHSAA Advisory Committee to bring up in the next FHSAA track and field meeting in May. These discussion topics were only voted to bring forward to the FHSAA. These are not permanent votes. They will go on to be discussed by the advisory committee and then the FHSAA. If you feel strongly about a certain issue, contact your committee member to discuss the topic. Here is the list of coaches on the advisory committee and their designated zones. The hottest topic of the weekend was to remove the 4x400m relay prelims at the state finals, so that it would just be ran as a timed final. The vote from the estimated 275 people in attendance was 70 in favor of the timed final to 2 in favor of the prelim and final, according to FACA chair, Dan Dearing. The other offered solution for the 4x400m relay was to combine the 24 teams and race them in 2 heats and use a waterfall start. This would mean no blocks and would look like the start of the current 3200m final at the state meet. This suggestion was voted no by 50 members and yes by 5 members in attendance. 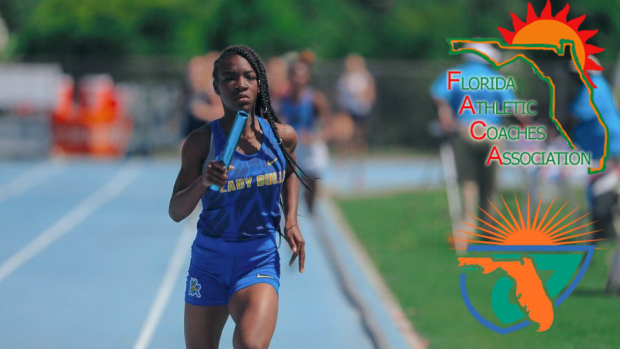 The FACA board discussed a unanimous vote to add a competition to the state finals for all above the knee amputees, return to the system where there is a 2 week open window for hosting district and regional meets, along with the FHSAA being required to post the District and Regional meet date windows for the 2020 season by the end of the school year. Coaches also expressed that at the state finals last year it was extremely difficult to coach while being in the same area as the fans. An idea of adding coaching boxes to areas for all events for coaches was discussed. This would mean there would be designated areas for coaches to go with their credentials to coach their jumpers, runners, and throwers. This is an administrative change and does not require committee approval. Ed Thompson was present for this suggestion. More details on what was voted at FACA clinic. Any garment that is worn underneath the uniform (i.e. tights and t-shirts) are not subject to color and/or logo restrictions. ALL relays must wear uniforms that indicate with color, logo, and color combination that all team members are on the same team. Many teams will have slight differences in design of their uniforms, this rule makes it so that this slight difference will not negatively impact the team. Simply clarifies the measurements when using the metric system to measure performance. Makes sure that pit measurements are up to safety standards. The distance from the takeoff board can be adjusted to accommodate different levels of competition. Names on your Home Campus rosters need to be uploaded into DirectAthletics/TFFRS in order to have your athletes eligible for state series competition. More information to come on how MileSplit will be compatible with this change. For this 2019 season, javelin will be thrown as a showcase at the state meet. USATF Florida Association is hosting a Javelin Clinic at Tavares HS on January 26, 2019. Click here for more details. Athletes will not be disqualified from other state series competitions for a no-show or scratched performance on a non-qualified event. Meaning - If an athlete decides to scratch a preliminary race at the district meet, there will be no penalty because the athlete did not qualify for the event, however if the athlete scratches in a final event at the district meet, there will be a penalty and the athlete will not be allowed to compete in any further competition. Eight athletes are eligible to compete on a relay team and must be declared when district entries are due. Changes on the team of 4 relay participants must come from this pool of 8. You can rent equipment for student athletes with physical disabilities through the FHSAA's Equipment Loaner Program.